If you remember last year I became open on how I have some 20-something panics. I became very worried on certain parts of my life. I guess this is about the whole “responsibilities” sinking in for I am now earning my own money and making some decisions that could possibly change my life in the future. But you know what I realized? The identity crisis, career issues, familial responsibility and money management shouldn’t be cause of depression for all the 20-somethings rather should be a motivation to be financially independent. Encourage you to take advantage of your current age. 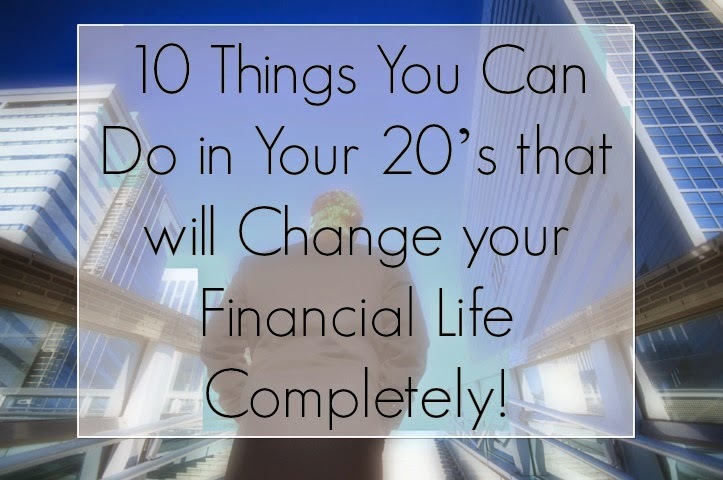 If you are in your 20’s then this 10 things are highly advantageous. However if you are already in your 30’s, 40’s or 50’s, don’t fret… you can still accomplish the 10 things below though you’ll most probably reap the rewards not the same way as those who made them earlier. Prove that time is the greatest determinant of wealth. I remember the saying I once read in Pinterest, it says… True wealth is determined by how well one manages his/her time. 1. Start having your savings. I know this may sound as paulit-ulit but its true, saving from the moment you first had your earning is the best decision you can ever do for your finances. You can start by saving 500pesos per cut-off or by doing the 52-Week Money Challenge on every year you are working. If you are wondering how you can save with the sweldo that you have at the moment then check out my previous blog post, How to Save Within Your Salary. 2. Don’t be too Proud. Not because you are already working does it mean that you can stand on your own. Live with your parents (if and then it is ok) so that you can save more money. As we all know most fresh graduates end up having start-up sweldo (11,000-13,000). If you start living independently then all the bills, rent, utilities, laundry, food and stuff will be in your responsibility thus you can not maximize your small salary for your future self. 3. Learn to Spend Within Your Means. We may feel like in YOLO (You Only Live Once) and spend way too much than our monthly sweldo but this very action can cause severe damage to our finances. If you control your spending and try to live just within your means then you will be able prepare for your future better. That means sticking to a frugal lifestyle especially now that you are just starting to learn the ins and outs of the adult life. 4. Follow a lifestyle that suit your current financial status. Just the same with #3, you need to be very intelligent in choosing the lifestyle you will live by. Surround yourself with friends an colleagues who can influence you with good financial habits and not lead you to spend too much that what you are ought to spend. 5. Learn the value of long term investments. I know how hard it is to resist the temptation of spending on gadgets, clothing, dining out and so on especially if you are already earning through your hard work. I’ve been in that situation before just as what I blogged on Things that Ruin My Budget 1 and 2. I have always have excuses for the unwanted expenses that I commit. It would matter a lot if you instead of thinking about the things that could give you immediate and at some point short term enjoyment, try to focus on the long term happiness that a new car, new house or even a small business can do to you in the future. Save before you spend. Think about your goals in life always and forever. Now that you are just starting living your life is the best moment to learn how to budget effectively. I have a whole lot of posts involving this financial concept that I will link below but I believe that once good reason for you to budget is because this way you will have a basis for the money that comes in and comes out of your kaban. The earlier you learn how to budget the better you will become in managing your money. 20’s is the best time to start investing in investing vehicles such as mutual fund or stock market. You have the best appetite to leave your money in a trusted financial institution and invest in a monthly basis unlike in the 30’s or 40’s that the priorities will be more of marriage and family. Investing in your 20’s will also mean taking advantage of the compound interest that your money will earn. You view the example I created in my blog post Rule of 72. I know this may sound morbid… but it all boils down to being prepared and secured in life. Just like what I learned in Series 1 of IMG Wealth Academy, we will either dies too soon or live too long and investing in a life insurance is the best way to protect yourself and your loved ones. The younger you are the cheaper your monthly contribution so it is exactly win-win situation for you. 9. Have your first savings account. If you have your payroll account then good but if you want to really save even better you can start your emergency fund by opening a savings account apart from what way provided to you by your company. Treat that savings account as your virtual alkansiya and start putting as little as 500pesos per pay day. You will be surprised how much your savings will be at the end of the year. 10. Create Multiple Streams of Income. They say that the 20’s are the most productive years in a man’s life. You have all the energy to work and you also have all the time since you are not that eager to start having your own family. It is also the best time to invest your time and your effort in finding jobs that offers additional income or honing your skills that could matter a lot in your finances. I am in the hope that you will take advantage of your age and start acting in your finances as early as now. You have all the power to change your current financial status. Be determined, work hard and take the first step towards financial freedom. Are You Ready to Ride? Here are the Investment Vehicles You Ought to Know – New!